06:30am, up and running, head out to the Fire Station to re shoot the interview video for 20/20, 6 hours later it was edited and on the way to ABC via cosmic rays. While I was out, good old Earl (Mr.Mile Post man or Mr. Brown) came by the Ramada Hotel to meet the crew and have breakfast with them. Laura is felling better, she hasn't been felling well for the past couple of days, just in case we made a stop by the health clinic, the doctor gave her the okay to travel. We finally got on the road by late afternoon. A quick stop to film and take photos at the lookout near the summit of Steamboat mountain turned into a few hours stop. The van pulled into the lookout like a dragon blowing flames out its nastros the van was blowing steam from under the hood. The steep climbing under the wornag gear overheated the engine. Luckly we cauth it on time, waited for it to cool down, re filled the radiator, instructed the driver oions on how to drive it. The view from the lookout was spetacular, could see so far away, far in the horizon white mountains top painted a picture perfect post card. A previledge to witness such a beauty. The air was cold but the sun kept us warm. Glad to have Earl joining me again on the tour, its beein a while since last I saw him at the writers retreat last November. He is such a character, the life of the party, the kind of person everyone want to be around, a man of his word, a kid at heart. He got water from a natural spring across from the lookout to fill the radiator. However, the water was a bit too dark. So, I used destilled water that was being used to clean the array. Everyone was relaxing a bit, when Mr. Brown grabbed the pail full of cold spring water and swachchchch! throw water all over everyone, Sue got the most out of it along with a video camera and a voice recorder. I tried to get him at a later time. Well, Mr.Brown can run really fast. I only had 1/10 of the pail full, just enough to give him and anyone near him a light spray. It didn't quite worked the way I wanted. Earl saw me coming with the pail and didn't think twice, he ran like a gazelle, got to tell you he would easily won a 50m sprint . Claire ended up getting the bulk of the water, and she screamed as she got soaked making birds fly, the earth shake and all of us laugh to a tommy ache, it was so funny. No one was expecting. Lunch was the compliments of Sue, deep beef sandwiches and salads, thanks Sue. I was very disappointed with the damage to the radiatior. Without a sponsor, money is tight, in the presense of such amazing landscape and Mr. Browns funny anecdoted it was just impossible to keep a long face. A green banana could potentially plug the hole but no luck, the bananas we had were ripe. I didn't even bother trying it. A couple of hours later, the radiator colled down, the array was tilted, we got some good charge on the batteries. The journey resumed. Just was we were about to leave a pick-up truck with two girls parked blocking our view. Later on the road, I spotted a black bear on the side of the road, pulled over, had the car and camera facing the bears, and seconds later the same car pulls in front of me, spoiling my shot. I wasn't a happy camper. 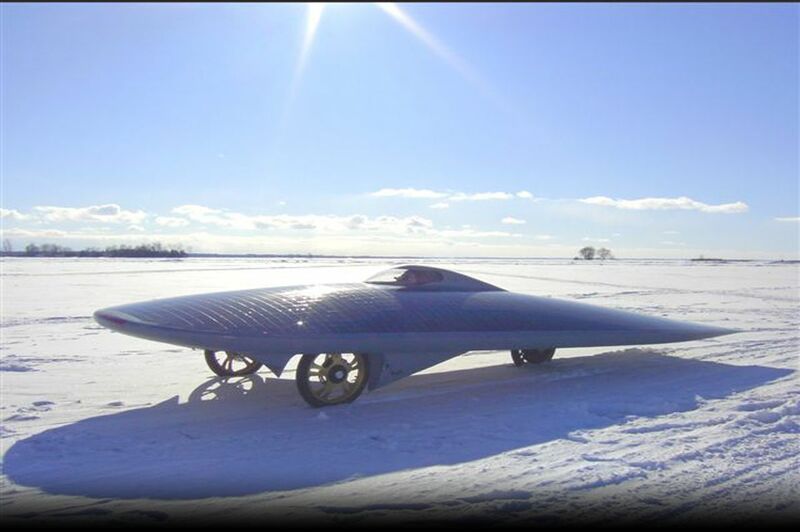 Gee, so much space they had to stop right in front of the solar car, I thought it to be very inconsiderate. There were a number of animals on the road, I saw two deer in one location, a moose, another deer and another moose right by Summit Lake, where we camped for the night. , Arrived at Summit lake, the highest point on the Alaska highway. Aloa a very good morning to everybody! We woke up by a phone call that Earl and Sue were waiting for us down the stairs for some breakfast. We went down and finally had the opportunity to meet Earl. It is an awesome guy, still a little kid like all of us! While we were eating his dog took of and he is still jet to be found. Haha it is the first dog owner I know who didn’t worried at all. Marcelo was redoing the interview for twenty-twenty and arrived at the hotel around noon. We cleaned up the hotel room and went to fire station to pick up the solar car were it had stayed overnight. Laura was still not feeling well so Marcelo, Earl and me brought her to the clinic again. The doctor told us not to worry, she is doing fine just let her rest and drink enough. With this good news we finally left for the north with our awesome new team members Sue and Earl. I drove with Earl and had the opportunity to make pictures with the biggest lens camera ever!! Unfortunate the van wasn’t pulling the mountains that good and the radiator had gotten overheated. We pulled over at a beautiful spot with an awesome overview over the mountains. We were running up and down like a bunch of young puppies throwing water at each other and drinking waterfall cold beer thanks to Earl! In the mean time the solar car was charging and after a little while we left for some more kilometers. The landscape was magical and beautiful, the fresh air outside finished it all of. The world is AWESOME!! We were going up the hill for a long time so the batteries were getting low and we had found a nice place to camp out for the night. In the mean time the dog of Earl was still lost and wondering around Fort Nelson. Today on the Alaska Highway I have had seen five bears, one caribou, two moose’s and a deer. It is like driving through a safari park! With the coldness outside, the snow boarder coming down on us, we felt asleep like rocks! I wake up covered in sweat, maybe nightmares but I think more likely my fever has finally broken! Walking to the tub I feel dizzy and drunk, but better...my back and neck are still incredibly painful and stiff, restricting my range of motion. My morning is spent in bed while the crew uploads video to the 20/20 server. Before we leave Marcelo insists I return to the clinic to make sure I am better and ok to continue. Earl drives me, Willy, and Marcelo to the clinic. Back in the doctor’s office again with Willy, the receptionist reminds me it will be another $70...yeah, thanks...what happened to free health car in Canada- oh it’s only for Canadians, but I have a royal Canadian service battalion jacket...oh well. The wait is a bit longer this time. The doctor asks me if I started the antibiotics. The bottle is still unopened and my answer is “Yeah, I ate 5 raw garlic cloves.” I love the looks doctors make when they hear about my preference for natural alternative hippy dippy healing. Dr. Cosa laughs and is happy I’m feeling and looking better. He says I can continue on the journey and should keep the drugs just in case. Everyone jokes that I smell of garlic so much that I’ll make a tasty meal for the bears if I don’t get well. Willy talks with the doctor in Dutch before they shake hands and he wishes me well. We lay in the same spot of grass as last time waiting for Earl and Marcelo to pick us up. Earl drives up on the grass just inches from my head. Inside I break the news to them gently, I am going to die, we all are, but not today, so we can keep driving to Innuvik! We make a stop at the grocery store for more og apple juice and a whole jug of water for me to stay hydrated. After rounding up the crew and fixing the sun roof we get on the highway with Sue and Earl with us. Earl’s camera has a rediculous zoom on it, like two feet long. With my professional prognosis of good health I feel good enough to run the blocks from Earl’s truck to the solar car. I end up with a pounding headache and need to lay down in the van. My fever comes back so I take and advil and retreat to happy sleep land. After resting for a bit I open my eyes and feel all the light of the world burning into my retinas. I request sunglasses from Claire in the front and Josh starts freaking out saying that sensitivity to light is one of the symptoms of West Nile Virus. I’m able to work on updates for a bit but soon go back to sleep. I think we camp for the night in the mountains but stay unconscious for most of the evening. This morning we arose, and Marcelo was gone. We had no idea where he was, but assumed he was taking the time to work on some of the uploads and videos for the 20/20 news special. Not knowing what to do, Claire and I worked on updates, while Laura slept in. Earl Brown, who had been on the Xof1 team last year, came into town from Whitehorse. Earl had just given his old car to Sue, who would, along with Earl, join the team for the day. While we ate breakfast, awaiting Marcelo's return, we found out that the postcards that Claire and I had purchased at the Ramada were of photos that Earl had taken. He truly is an incredible photographer, and all around good guy. Michael, Laura, Marcelo, and Earl went to take Laura to the clinic to see if she was well. I stayed behind to clean up, and help Claire with updates. After Marcelo returned, we packed up and decided to bring Laura to Whitehorse, hoping that she might regain her health in the meantime. Claire made some leftover pasta from lunch the other day. Being in a rush, Claire and I ate straight out of the pot. It was like Lady and the Tramp, without the puppy dog kisses. We got packed up quickly, and said our goodbyes to Jim. He had let us stay for two and a half days, and it was so nice of him to support the solar car team for the past few days. The people we have met in Fort Nelson have been so nice to us, and I really have enjoyed being able to get some work done. I drove the van by the fire station to pick up the solar car. In no time we were on the road again!! Driving up the Alaskan highway is simply breathtaking. We were burning up the mountain pretty fast. Unfortunately, the radiator overheated. We cooled down on Steamboat mountain, which was one of the best spots possible to stop. While we worked to fix the radiator, Earl and Sue brought out Greek salads for everyone. Earl even had some great beers to share with us. We cooled the beers under the same mountain waterfall that we used to fill the radiator with cool water. This same ice cold waterfall fluid doused Claire in an unexpected spray of water to her body via a bucket in Earl's hands. Everyone was laughing hysterically. The array had a chance to charge, the car was repaired for the moment, and we headed off for a great sunset shot. We went to Summit Lake, seeing bears and caribou along the way. When we parked, we even saw a huge moose by our campsite I took some closeup photos of the moose against an amazing mountain backdrop, and I bid farewell to Earl and Sue, our newest friends, temporary team members, and excellent photographers. Tomorrow, the infamous Muncho Lake! pulled in we saw a female moose about 25 yards away. I don't know if Earl made any moose calls or if she simply had an interest in solar powered vehicles, but she looked right to us and started walking closer. Marcelo's face was priceless. Absolutely petrified at the thought of a moose mounting his record breaking sunshine ride. At about 4,300ft high and a lightly snowcapped mountain towered nearby, it's a combination that seldom comes without a distinct chill. I resolved to put on as many clothes as possible, restrained only by the possibility of not fitting into my sleeping bag. It was my turn to get up the next morning to put up the array so I hurried up to escape that knowledge in some half-lit hours of sleep. Earl is on the team again!! Claire entertains everyone with a funky dance while trying to get rid of a bug that managed to crawl inside her shirt. The Alaska highway is amazing! The road is our home! A mosquito is feesting on Earls ear. River + nature = pretty! Part of the biker gang! The Alaska highway has a new surprise after every turn! The snow is getting close! Those are all squashed bugs, no dirt!